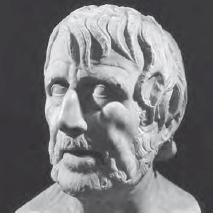 Roman stoicism was developed by Seneca the Younger (1–65 C.E. ), Epictetus (c. 55–135 B.C.E) and the emperor Marcus Aurelius (121–80 C.E. ), who wrote Meditations. Many were moved by Marcus Aurelius’ advice about restraining anger at his weak subjects: “Do not be turned into ‘Caesar,’ or dyed by the purple: for that happens.” Roman stoicism was influential in the Renaissance and the modern period, and to this day it underlies codes of behavior and moral values in military communities. The basic stoic premise is that we are obligated to understand the nature of the things we deal with and be prepared to accept, without fuss, unwanted events that are not under our control. Epictetus is famous for saying that if your favorite clay pot breaks, you should remember that it was always fragile and not yours to begin with. And if your spouse or child dies, that is a reminder that they are mortals, something that we should always remember about the human beings we love. Seneca was a playwright, statesman, and one-time tutor to Roman emperor Nero. He was also a contributor to stoic philosophy (Art Archive).